Business opportunity scam strikes again. 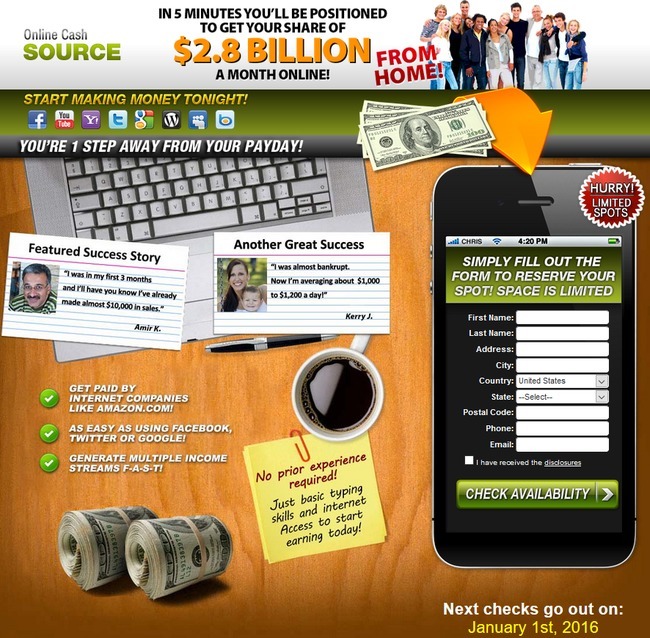 Online Cash Source is one of the more creative scams out there, where it lures you bit by bit into the world of crazy up sells. Read this Online Cash Source review to find out the truth behind the scam. Online Cash Source scam uses a fake news site to get the attention of unsuspecting internet users. They mainly advertise in social media network such as Facebook, where people share news freely, or simply as a pop-up when you visit other websites. On the surface, this page looks like a regular piece of news, but don’t be fooled – this is just a sales page disguised as a news site. One way you can do to check if it’s a fake is to click on various links within the page. In this case, no matter where you click on the page, you’ll be brought to the homepage of Online Cash Source. Online Cash Source scam wastes no time in acquiring all your sensitive information. Once you click on the news article, they know that you are interested in the lucrative business described, and proceed to take as much personal information as possible. It’s normal for any website to request some basic information such as name and email address to register for an account or to “check availability”, as Online Cash Source claims. However, if an unknown website requests for your personal information such as phone number and home address right off the bat, you have to be very careful. In most cases, they turn out to be phishing scams. Online Cash Source is one such example. Once you provide your phone number, even if you don’t buy their product, you will receive unsolicited sales calls pitching you various shady online opportunities. If that’s not enough to convince you it’s a scam site, let me show you one more proof. 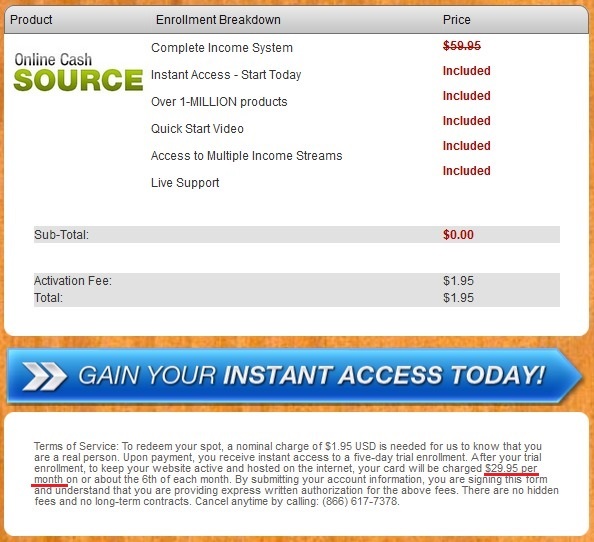 Online Cash Source scam has a duplicate site called Online Web Cash, and they promote exactly the same program. You don’t see legitimate businesses with duplicate scam sites. Online Cash Source scam is almost as bad as the infamous link-posting scam sites we’ve reviewed earlier, such as Work at Home Institute, Work at Home University, and Work at Home Cash. I have an old number that I use for these kind of scams, and I receive spam calls on a daily basis. So if you value your privacy, please do not enter your personal particulars. I will walk you through the page hidden behind the form, and let you know that you did not miss a good opportunity. 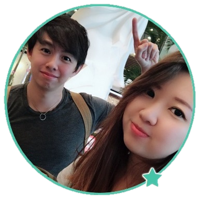 Actually, if you are determined to make money online, I recommend that you use the Wealthy Affiliate, the legitimate program that helped me succeed. It’s free to get started. If you’ve provided all your personal information for Online Cash Source and hope to get more information about the opportunity, you’ll be sorely disappointed. There is nothing on the second page, except for a payment form. The second page is LITERALLY just a payment page. No further information about the opportunity, and there’s also no explanation on how the business work. You have to pay to know what it is about. Anyway, the activation fees quoted is very low at just $1.95. If you think it’s a fair price to pay to uncover the ultimate secret, you’re in for a world of hurt. If you take the time and read the fine prints (underlined in red), you’ll realize that the $1.95 is just a start. Once you finish your five-day trial, you’ll be charged $29.95 per month. However, that’s no the end of it. For the sake of researching Online Cash Source, I paid the $1.95 activation fee but reminded myself to cancel the membership before my 5 days trial was over. Within hours of activating my account, I had a consultation phone call from Online Cash Source team asking me to upgrade my membership, so they can help me make money faster. The up sell alone will cost me $1,500, but I was told that I will make it back in no time at all. Actually it reminds me of another scam with outrageous up sells, MOBE, in which I used to be an unfortunate victim. Don’t buy into these kind of up sells. You don’t have to pay so much to kick start your business online. And by the way, Online Cash Source scam is all about getting you to setup your own website and putting up affiliate links from Amazon. Wealthy Affiliate teaches you the same stuffs, and you don’t have to pay a cent to get started.